The newest addition to the Las Vegas Strip, the Cosmpolitan of Las Vegas exudes luxury and class with a fresh perspective - overlooking the heart of the strip. Rooms at the Cosmopolitan offer residential-style living spaces and one-of-a-kind private terraces unlike any other Las Vegas Resort. 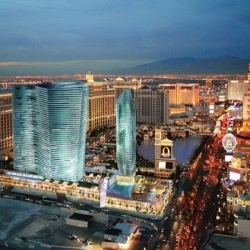 The Cosmopolitan Casino offers 100,000 square feet of gaming offering all your favorite table and slot games. Private Casino Cabanas are available which offer a part exclusive social atmosphere. Along with floor to ceiling glass walls which offer great views of the Las Vegas Boulevard. Save up to 50% hotel rooms! With our partner rates, you can save up to 50% off retail rates for Cosmopolitan! Complete the form below and we'll send you a free Cosmopolitan quote on your next trip to Las Vegas - no golf required!